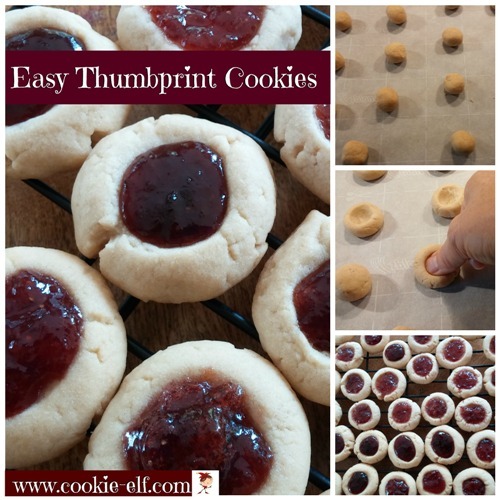 These Easy Thumbprint Cookies are a simplified version of the traditional classic – small rolled cookies with wells pressed in the center, filled with a scrumptious topping, usually jam. They are a favorite cookie recipe for kids, who find immense fun in rolling the dough into balls and pressing a finger or thumb in the middle – hence the cookies' name. Thumbprint cookies have also been dubbed elsewhere as Bird’s Nest Cookies, Butter Balls, Polish Tea Cakes, and in Swedish Hallongrotta (which means “Raspberry Cave”). In a medium bowl, using an electric mixer on medium speed, cream butter and sugar until light and fluffy, scraping the bowl continually, about 1-2 minutes. Add egg yolks and extract. Beat until smooth. Reduce speed to low. Gradually stir flour mixture into creamed mixture a bit at a time until well blended, scraping the bowl constantly. Dough will be thick. If dough is too sticky to work with, cover the bowl with plastic wrap and set it in the refrigerator for 15-30 minutes until chilled. Scoop dough into large, marble-sized balls about 1 inch in diameter. Roll balls in between the palms of your hands until smooth. Set the balls onto prepared baking pan, about 2 inches apart. Dip your thumb or your knuckle into a bit of water until it is damp, but not dripping wet. Press your thumb or knuckle in the center of each ball, leaving a small well. Spoon ¼ teaspoon of jam into the well. Bake cookies for 10-12 minutes or until they are set but have not begun to brown. Remove baking sheets from the oven. Let cookies cool for a minute on baking sheets before using a spatula to remove them from the sheet to a cooling rack. Allow cookies to cool completely. Store in an airtight container with waxed paper in between layers. Save the egg whites to make meringues or to use in scrambled eggs. Cookies are prettiest when you roll balls no larger than 1 inch in diameter. Allow cookies to cool completely before you eat them. Otherwise, hot jam may burn your mouth. You can freeze Easy Thumbprint Cookies. To do so, prepare cookies with wells but do not fill with jam. Bake as directed. Freeze cookies. After you thaw them, spoon jam into wells and serve. Add a touch of elegance to cookies when you dust cooled cookies with powdered sugar. Coconut Thumbprint Cookies: coconut inside and out!